In a world bursting with musical trappings, tastes, intrigues, and developments, where does one find the nexus of it all? Music is, as it always has been, a labyrinthian mosaic that pushes and pulls at our fluid emotional states, and for every person on the planet, there is some tone that rings just right in his or her ears. As a natural result there’s a multitude of social scenes and collectives that create their own bubbled zions of aural stylings, so as to connect with like-minded individuals and explore the depths of familiar genres. The modern music festival often attempts to cross-pollinate various music cultures, but Elements Lakewood achieves this vision to its fullest capacity. Elements Lakewood, hosted during Memorial Day weekend by NYC-based production company BangOn! NYC, is an experiment in combining the often at-odds camps of broken and steady beat electronic music. On the surface these collectives could not be further apart; from phenotypes to vernacular, waves of influence, venues, clothing, and demographics. The 4x4 dust-kickers and heavy bass head-nodders seem like spiritual opposites. This dichotomy is, however, only skin-deep. Push past the vain and perfunctory surface of either music scene and you’ll find that many of the same speaker creatures inhabit both worlds simultaneously out of their sheer love for all things boisterous within the wildest music of our generation. Elements Lakewood is situated in a pastoral rural community in Northeastern Pennsylvania that is its namesake. The grounds themselves are a wondrous cornucopia of rolling hills, forest glades, throughways swampy and dusty surrounding a petit, picturesque lake. Across the expanse of property are the familiar trappings of any purebred American summer camp, all of which would be leveraged to create a well-organized and immersive festival experience. The facilities and materials were all available, the proper permits were filed, all the revelers were gathered. From the start of the weekend, BangOn! and a host of collaborative production companies presented a multifaceted aural adventure offering passage through every rabbit hole imaginable. Backed by eight stages of varying design, power, and vanity, the force of over 100 musical acts was unleashed on a torrent of jubilous weekend warriors. Each stage was tailored to curate a particular atmosphere and headspace, but was simultaneously inviting to anyone who wandered close enough. 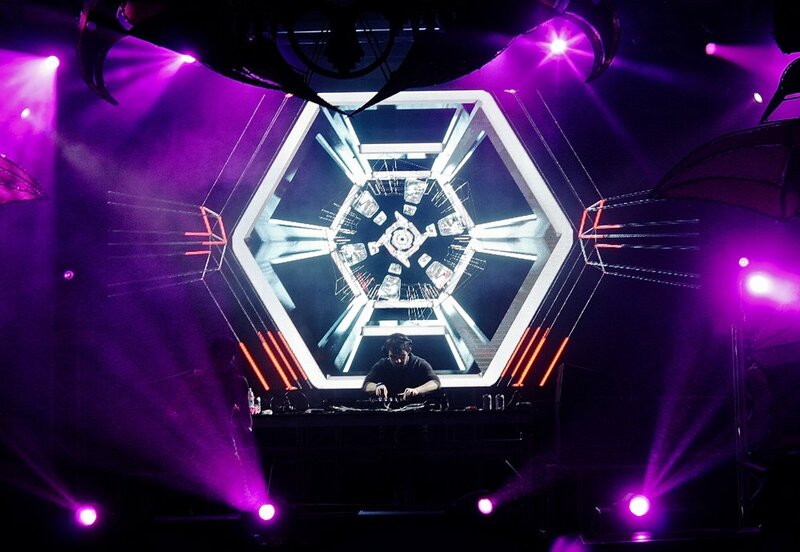 At the entrance to the festival, you’re presented with the most technologically equipped stage at the event. Conceived and designed by The Reliquarium and Rhizome, the Earth Stage presented a formidable array of well-tuned speakers, lasers, lights, projection mapping, and fidelitous LED screens. Surrounding it stood a series of art cars and asymmetric structures that created the natural boundaries of the dance space and added dimension to this particular party. The soft earth bore the wounds of a thousand boots, birkenstocks, and bare feet kicking and pounding at the grass and dirt below, a sure demarcation of the round-the-clock revelry at hand. The talent featured here varied stylistically, but was unified under the theme of broken-beat bass music and eclectic livetronica acts. 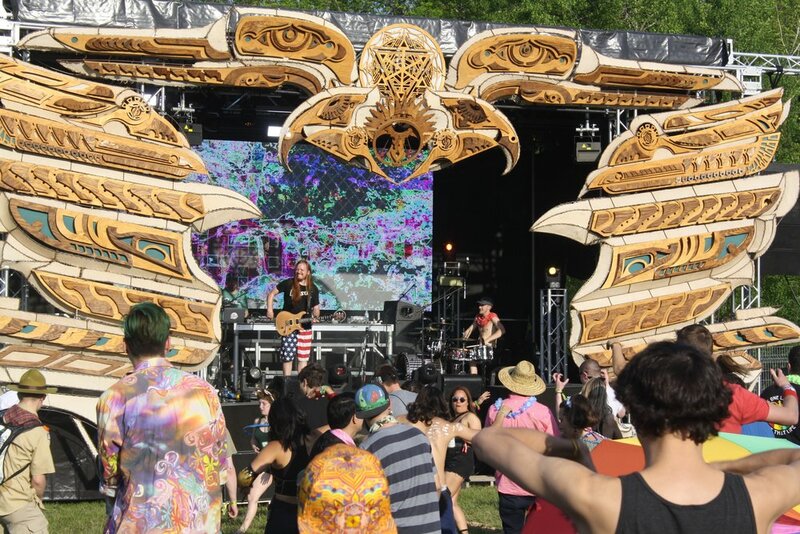 Some of the movers and shakers tapped to perform on the Earth Stage included Detox Unit, Wax Future, Somatoast, Charles the First, DeeZ, Smigonaut, and the legendary Stickybuds, whose first Northeast US set in four years exceeded expectations. As the result of a last minute cancellation and some help from a few friends, 5AM assumed the stage and pulled off a surprise slam-dunk performance to close out Saturday night. Rolling past the Earth Stage one arrived at center camp surrounded by a host of repurposed cabins and structures inhabited by festival staff and some of the various companies recruited to add their flair to Elements. Harm reduction organizations DanceSafe and Harmonia set up shop around center camp and maintained staff throughout the day and night to keep folks safe, educated, and at an advantage in this complex, indulgence-laden atmosphere. Here was also the WellNest, a multifaceted workshop space that supplemented the overarching theme of health, cognizance, and connectivity with yoga, flow workshops, meditations, and lectures on everything from consent to mushrooms. A stone’s throw across the road from the WellNest was an innocuous front porch with an equally innocuous name; the Porch Stage. A laid back alignment of singer-songwriters and groovy instrumental bands cycled through here during the day. By night the building came alive as the Wub Hub, welcoming a host of deep frequency freaks seeking prime cuts of contemporary low-end production. Saturday evening saw Good Looks Collective and Sermon join forces to present another installation of NYC’s beloved After Dub events, bringing along the talents of Honeycomb, Brightside, Ethan Glass, Saltus, Zoo Logic, and Doctor Jeep. Descending from center camp towards the lake, the Water Stage hosted light fair during the day. Party-goers were splayed along the beach lounging in the sun, washing down crab cakes with obscenely overpriced Modelos, dancing and bouncing atop a docked pirate ship, and occasionally testing the water on one of many free kayaks, canoes, and rowboats. This stage featured no flashy fanfare, just a DJM mixer, a few CDjs, and a full serving of bread-and-butter house DJs to maintain the vibe during those peak daylight hours. Noteworthy musical curations were provided by Agents of Vibe, The 1989, NSR, Trotter, and Dropkat. Fun in the sun is usually fun for everyone, but we all need reprieve from the heat. Lucky for the sandy-haired shufflers, the bounty and sprawl of the neighboring woods would provide more than just shade. One step into the forest at large revealed a bevy of art installations and visually-appealing structures. Here among the scattered branches and curious forest pathways one felt immersed in the core of Element’s creative ethos. The deepest layer of this topographical adventure housed the Air Stage. Constructed from a plethora of reconstituted wood and miscellaneous building materials, this organic structure overlooked a muddied glade that would host all manner of delinquents, dragon-chasers, ravers, techno heads, and casual party crawlers. A treehouse and a series of canopy walkways loomed over the stage creating a delightful spatial dynamic and morphing the traditional one-dimensional dancefloor into a true woodland hideaway. Swaying to the sounds of Lemurian, The Alchemist, Experiment.al, Maceo Plex and especially Lee Burridge in these woods was a nearly unparalleled pleasure. Doubling back deeper into the woods a rising hill gives way to the Alchemy Stage. A small pavillion decorated with medieval flare, a few strong speakers, a fire pit, and a curious tent housing the mobile shop of Ambrosia Elixirs created a self-contained but welcoming atmosphere. This nestled space served as a resting ground during midday and a hip-shaker’s battleground by night. The earthy aroma of those organic elixirs filling the nostrils of passersby. As the sun passed its midway point in the sky above and the surrounding air began to cool the Alchemy Stage would spring to life. So began the longest running micro-party of the event, running nonstop until 10:00 AM the next morning on the first day alone. Psychedelic variants of house and its related genres pulsated from the sound system forcing every passerby to give themselves up to the aural journey at hand for at least a few minutes. Here the disparate audiences from the four other elemental stages were fused into a new micro-community; alchemy. Some of the performers elevating the vibrations here included Soul Potion, Eli Light, Bushwick AV, and Devotion. Emerging from the tree line past the edges of the Alchemy Stage, a grassy knoll overlooking the vast expanse of the festival bore the weight of the final stage and its vivacious, feet sweeping crowds. Created from an amalgamation of Incendia domes and light fixtures, surrounded on all sides by massive art cars and makeshift lounges, the Fire Stage lived up to its name figuratively and literally. This space hosted the most bawdy and brawny of the weekend's house music as oncoming waves of libidinous dancers took to the blasting pyrotechnics like moths to a flame. The rumble of high-powered subwoofers was felt far enough away to get a body moving with nothing more than rhythm alone, and once fully submerged in the growing mud marsh in front of the decks, there was absolutely no escape. Serving as the yin to the Earth Stage’s yang, the Fire Stage featured some of the most esteemed 4x4 producer/DJs currently running their slice of the scene, including Lee Reynolds, Chris Lake, Ardalan, and the venerable Claude Von Stroke. It could be assumed that respective heads would gather primarily at the stages curating their particular flavor of electronic music, but that assumption would be not entirely correct. The extent to which true cross-pollination occurred within Elements Lakewood cannot be overstated. It was evident that every corner of the electronic music counterculture was well represented at all stages simultaneously. Elements Lakewood wasn’t just a hodgepodge of fandoms finding common ground with one another, but a destination sought by audiophiles and countercultural types aware that the worlds of steady and broken beat music and their corresponding cultures exist as one wide culture of which we’re all a part. BangOn! set the stage for the 2018 festival season, and has since received a roaring response from all involved parties. With travelers coming in from seemingly the world over, BangOn! created a true melting pot and stirred it properly. Elements Lakewood has made an indelible mark on the community that propped it up in the first place, solidifying itself as a major contender for the affection and adoration of the Northeast US counterculture. With production companies and wellness services coming together across the board, this festival provided a fully engaged, responsive, and dynamic experience for all who made the trek.